What’s it like to learn to scuba dive? 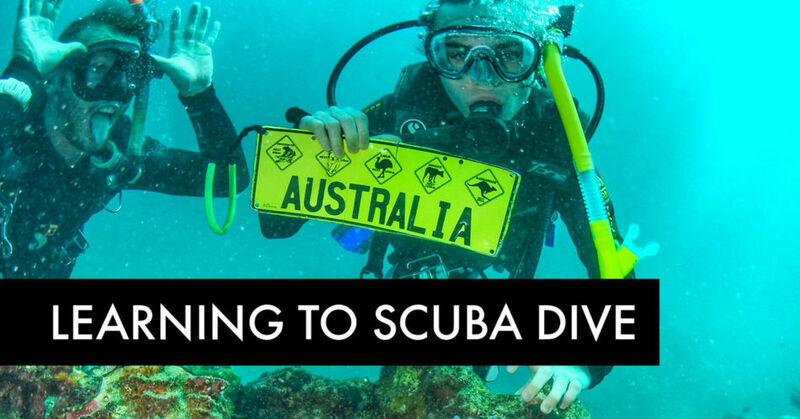 Our post covers the basics of scuba certification and follows my son learning to dive in Cairns, Australia and on the Great Barrier Reef with Divers Den, a local dive school and scuba operator. Yes, kids can scuba dive too, but how old do they need to be to scuba? Scuba diving courses are available for kids from 8, 10, 12 and 15, all leading to PADI scuba certification of various kinds. Scuba regulations with regards kids learning to dive are a little confusing, we’ll touch on that in this post. 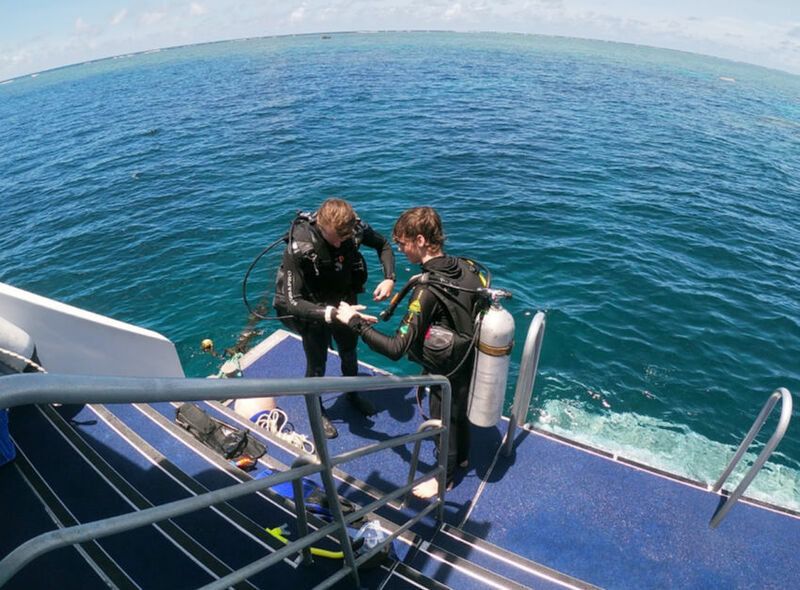 My 14-year-old completed his classroom, pool work and scuba exam at the Divers Den school in Cairns before completing his PADI Open Water Diver Certification on the Great Barrier Reef on both Reef Quest and Ocean Quest. The course is identical for adults. Reef Quest is a day boat taking scuba divers and snorkellers out to the reef for a day of fun from Cairns. 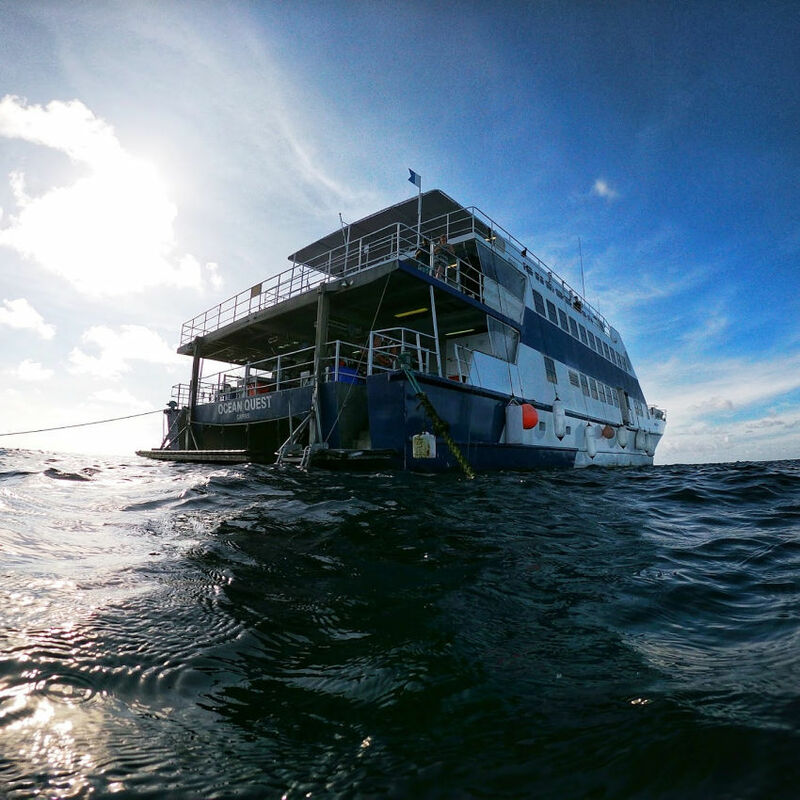 Ocean Quest is a live-aboard vessel and we spent 3 nights out there, as a family, enjoying the reef after transferring from Reef Quest. Both belong to Divers Den. My husband and I are both PADI Advanced Scuba Divers. The Advanced Course is an extension of the Open Water Diver course and takes a couple of extra days and some more challenging dives. My son learned to dive at 14 years old, he became interested after our manta ray encounter in Bali. Although he could have learned earlier we didn’t want to push him into it and also didn’t think he’s be terribly safe in the water as a young tween, so we waited. Unless otherwise stated all information below relates to our experiences and the regulations in Queensland Australia. Rules change all the time, please always do your own research and don’t take this post as a complete factual guide. What’s Involved in Learning to Dive? How Long Does Learning to Dive Take? Will You Need a Medical? Video- What it’s Like on The GBR, Snorkel, Scuba, Liveaboard and Sharks! What is a Live Aboard Dive Boat Like? What Creatures Will You See on the Great Barrier Reef? What Gear Do You Need to Buy? Learning to dive, off he goes, with his instructor from the snorkel platform on the back of Reef Quest. Meanwhile I was taking my first giant stride in over 10 years from the midships gate. Which was terrifying. But I knew I was in safe hands and quickly got my scuba back. PADI stands for Professional Association of Diving Instructors and has been in existence since 1966. It is a recreational diving membership and instructor organisation based in California. Most divers will be PADI registered and certified. Before being allowed to dive most scuba diving companies will want to check your PADI certification. PADI is the biggest of the global diving associations. 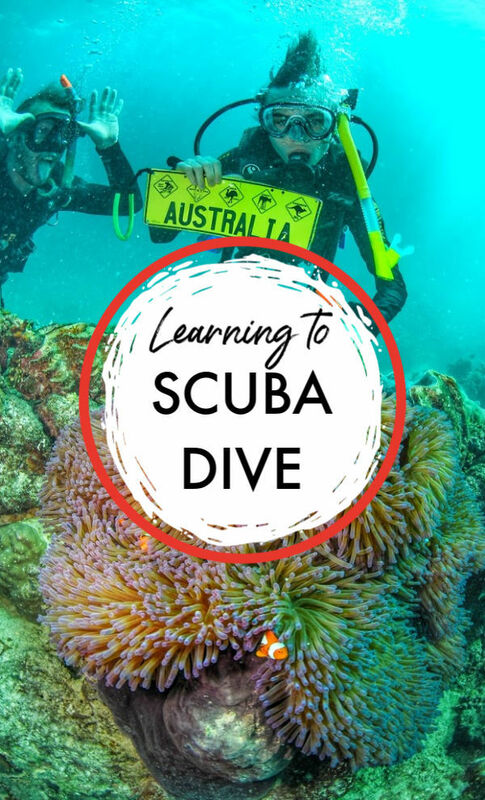 Alternatives to PADI do exist, including the British Sub-Aqua Club ( BSAC), Scuba Schools International (SSI) and Rebreather Association of International Divers (RAID). 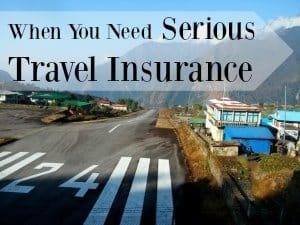 PADI is not your only option but it is the most common. We are PADI divers, so we’ll stick with talking about PADI for now. Do not take the information below as gospel, you must check local variations. This information comes directly from the PADI website, there is contradictory information even there. The levels below seem accurate for Queensland currently. You will notice as you travel that dive regulations can be extremely variable. The Open Water Diver certification is probably the one that’s most useful, that’s the one that allows you to dive with a buddy rather than a guide or instructor. From 12 onwards the Open Water course and qualification are identical for adults and kids but up to the age of 15 kids are classed as Junior Open Water Divers. This simply means that to the age of 15 they must dive with a certified adult. Open Water Divers can buddy dive, ie. they do not need to dive as a group or with an instructor. After the age of 15 adults and kids, no difference. ( see here) Maximum depth 18m. Divers from 12 can enter an Advanced Open Water course. ( see here). An Advanced certification ( my husband and I have this one) allows dives to 30m, with a deep dive and underwater navigation dive being compulsory. After these levels you can move on to Rescue Diver, Dive Master, Dive Instructor, PADI certifications seem to go on forever. To check all of this please refer to the PADI website and look up local variations. Down into the blue from Reef Quest, almost like his first day at school. Taking photos underwater is hard but a GoPro is a good piece of kit to have. We live in Far North Queensland and the Great Barrier Reef is our backyard. We looked around for a dive course or dive school for our son and settled on Divers Den. You can see the courses Divers Den offer here. Divers Den operate diving trips out of Cairns and Port Douglas. 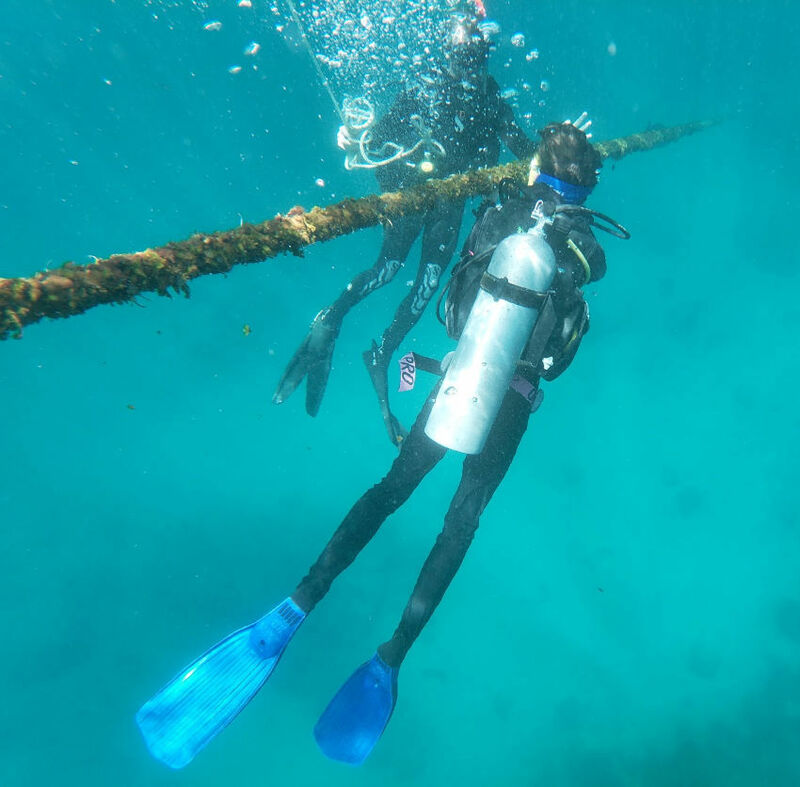 We used their dive school in Cairns and opted to finalise my son’s scuba diving certification on a live-aboard dive trip out of Cairns. We were based in Port Douglas so the Quicksilver Dive school in Port was tempting. It’s brand new, beautiful and purpose-built, but we went with Divers Den for a few reasons. Divers Den has been operating a long time ( since 1974) and has put thousands of divers safely in the water, they’re very proud to be one of the biggest dive schools in the world, the largest in Cairns and the longest established. My husband and I had dived with them before, years ago and had a great experience. They have a PADI 5 star development status, one of the highest awards a dive centre can receive. Their classroom and dive pool are all under one roof in Cairns, not far from Cairns Central mall. Divers Den was cheaper, but that wasn’t the clincher. We like smaller reef boats over the huge Quicksilver reef pontoons on Agincourt Reef. Quicksilver is a great day out, we’ve been to the reef with Quickie many times, but your decision must reflect your needs. Quicksilver’s smaller boat, Silversonic, is a great choice for divers, but we wanted a live-aboard. A live-aboard is the ultimate dive experience, guests live, eat and sleep diving for as many days as they care to stay. We thought a family live-aboard would be the icing on the cake and an incredible experience for all 4 of us, not just our young diver. Divers Den took us to Norman and Saxon Reefs both are outer reefs and they happen to be some of our favourite dive sites. We live up here, we’re lucky enough to have favourite reefs and dive sites that we like to revisit. The live-aboard through Divers Den allows divers to take part in their famous ” Sharks in the Dark” session along with night dives and fluoro dives. It sounded like fun! Your child will have to understand pressure, gases, some basic physiology and learn to assemble and dismantle their scuba gear. This set up is heavy and life saving. But honestly, it’s not too hard. Diving is physically demanding and tanks are heavy. Make sure your child is ready for that. Make sure they’re more than comfortable in the water. Let them snorkel first. Adults occasionally freak out and are unable to complete the course. Make sure your child has no fear of breathing under water. Your child must be able to tread water for 10 minutes or so and swim 200 m comfortably, as do adults. Pool work as part of the dive course. New divers practice skills for the first time. This is the pool at Divers Den, Cairns, showing the deep central area and shallow sections either end. Dive students can get acquainted with breathing under water in the shallow ends before heading to the bottom. Not my photo unfortunately, I couldn’t get in with the water with the students , but I was there observing, photo credit to Divers Den. There are 3 parts, maybe 4, to your dive course. There is classroom style learning, practicing procedures in the pool, swimming ability tests, quizzes and a 50 question exam, along with your open water dives. 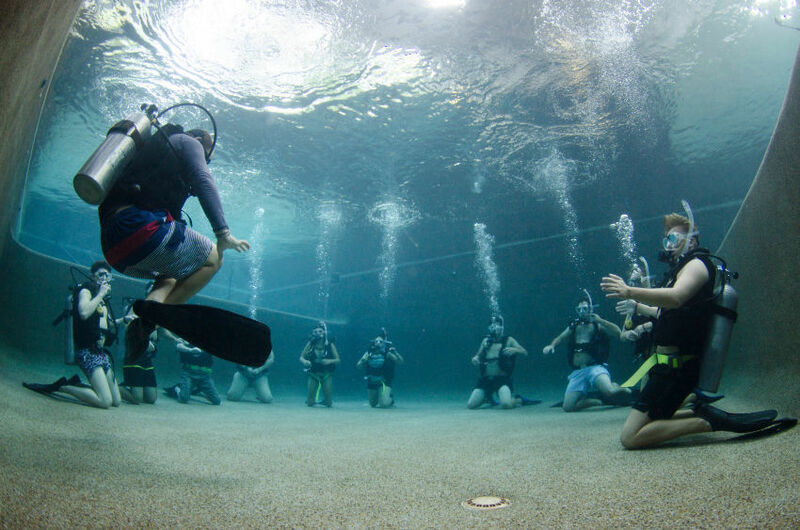 Sequence and order seems unpredictable but you’ll need 2 full days at the dive school. The exam isn’t too hard for kids. It’s hard to not pass. Most of the classroom section involves watching videos created by PADI. I’ll warn you, they’re boring. Don’t turn up sleepy. The pool sessions are fun though. Up here in Far North Queensland the open water dives are on the reef and those long boat trips add to the cost of local dive courses. The Great Barrier Reef is 1 to 1.5 hours from Cairns and Port Douglas by boat. In other places you can learn from the beach. In our experience ( we learned from the beach at Magnetic Island) the reef is far preferable to waves, sand, surge and poor visibility. Your Open Water Certification with take you 3-4 days, so if you’re on a short vacation be aware of that. There are ways to experience diving without certification and some dive boats and schools do offer trial and taster dives. Reef Quest and Ocean Quest can do this. It is also possible to complete your pool and classroom segments before travelling to your dive destinations. In this instance Divers Den will allow you to complete your scuba certification out of Port Douglas or Cairns. Divers Den only offer 4 day courses, you can the time by taking the classroom section online through them. My husband and I had a compulsory dive medical when we learned years ago. It was an extra cost and inconvenience. These days a medical isn’t mandatory, but you will have to fill out medical questionnaires. Your answers will determine whether or not you need a medical. Over 45 s do need a medical, kids don’t have any special requirement. Aboard Reef Quest, D met his new instructor for his first two open water dives. 1 student, 1 instructor. That’s a bit good ! We’re not sure if this is always the case or if we just got lucky and there were no other students on our dates. 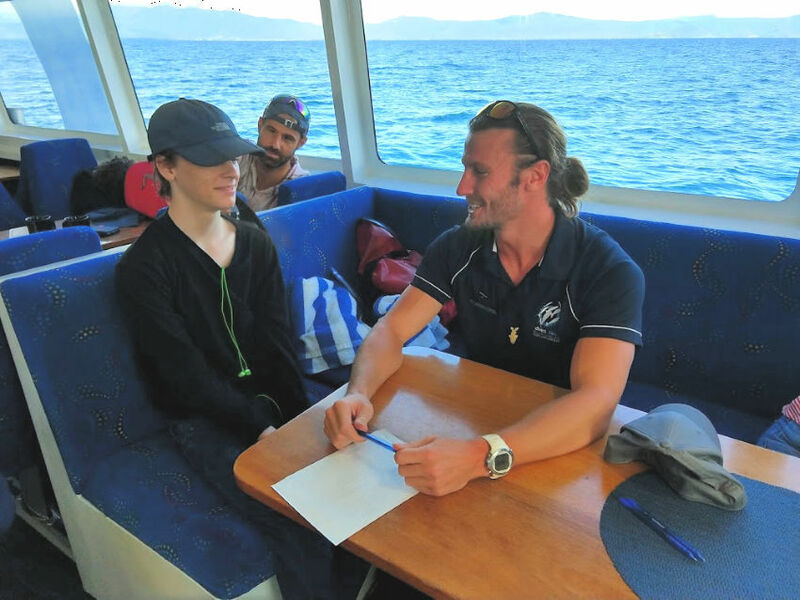 When we boarded Reef Quest from Cairns D met his instructor for the day, who whisked him away and had him busy with gear and paperwork between dives. Having a dive instructor all to yourself is phenomenal and we couldn’t have been more impressed. You can save this one to Pinterest! Use the red button at the bottom of the post. What a great holiday souvenir. Nemo on the Great Barrier Reef. D did this on his very first open water dive off Reef Quest. 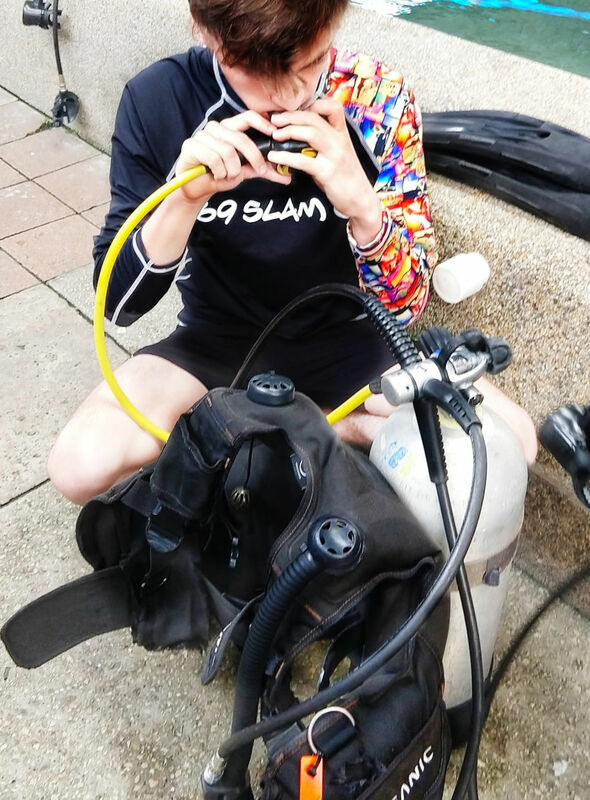 D completed 2 dives on Reef Quest before transferring to the live-aboard vessel, Ocean Quest, with us around 2.30 pm. His instructor didn’t come with us to Ocean Quest, D transferred to a second instructor for his final certification dive. All of the instructors and dive masters involved in our 4 days out there were off-the-scale-good. We couldn’t fault them. You can probably see from the video that conditions vary out on the reef. Sometimes it’s calm and still but if a storm rolls in you can get a bit of chop and surge. The visibility varies too but it’s generally pretty good. Water temperature can be 29 -30 C in summer, 21 C in winter, so sometimes you’ll need a stinger suit, sometimes a light wetsuit. Check out the sharks! Our floating home, Ocean Quest. I wish we could stay a month, it’s so relaxing yet active, so restful yet physical. I can’t fault this whole experience and we hope to be back for more. Cyclone Trevor rolled in on our last day and even he didn’t spoil it. Those dramatic skies and seas were worth seeing in themselves. 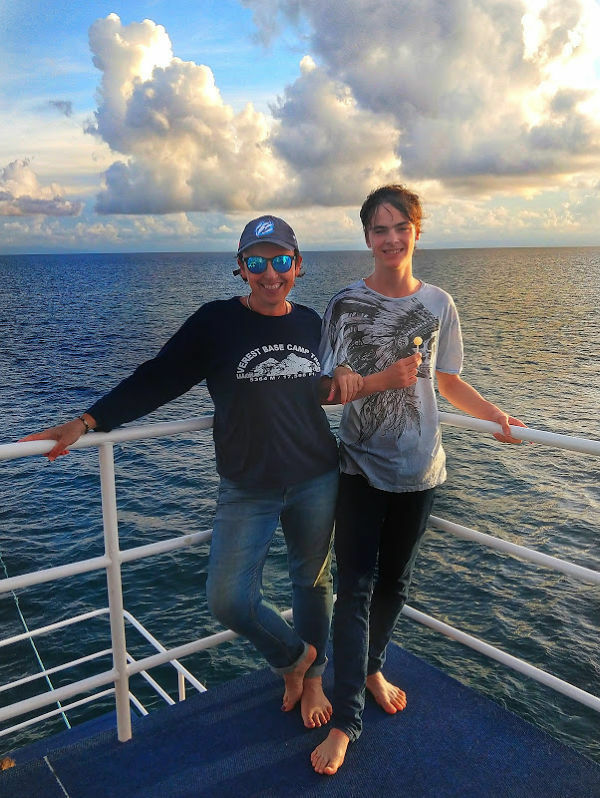 I can’t put everything in this post, so our second post in this series will be on the experience of live-aboard dive trips, with reference to Ocean Quest from Cairns. We can cover food, daily routines, night dives, equipment and the famous ” Sharks in the Dark”. We have much to tell ! We originally had 1 night booked but extended it to 3 because we were having such a good time. Funnily enough, that’s exactly what Chef and I did on this same trip 20+ years ago. We hope to take many more trips like this, all over the world, very soon. Sign up to follow. If you’re in a rush, see Divers Den’s liveaboard trips here. Wally, the beautiful Maori wrasse. You’ve got an extremely good chance of meeting Wally or one of his cousins out on the reef. Not my photo sadly, full credit to the Divers Den photographers. When Wally appeared for us he was being adored by a group of Japanese divers and there was no way I was going to get a photo. But he was there. He usually is. You will see hard coral and soft coral and yes, the coral will be healthy. You are likely to see sharks, white tip reef sharks, and they will most likely swim away from you as fast as they can. You have a good chance of seeing beautiful sea turtles, mostly green, maybe hawksbill. You will see parrot fish in every shade of blue and hear them munching on the coral. You will see a million tiny fish. Make sure you check out an identification chart before or after you dive. You may see an octopus or cuttlefish. We now call these baby kraken after our Divers Den experience, we saw both, plus a school of teeny tiny baby kraken maybe an inch long, pulsating with colour. If you’re a fan of Finding Nemo, you will find Nemo, possibly Dory, Gill and Jaques the cleaner shrimp. The star of the show is Wally. A giant, friendly Maori or Napoleon wrasse. These massive fish are the goofy overgrown puppy dogs of the sea and they seem to just love people. Please don’t touch. I saw too many people trying to touch, it’s not good for them. My favourites are the tiny things, the juvenile fish, the nudibranchs, starfish and cleaner fish. Just pause, look and enjoy. n stinger season you need a stinger suit, I haven’t come across a Great Barrier Reef tour boat that doesn’t provide them recently. You will need swimmers and sunblock. That’s about it. Try to buy reef-safe sunblock, sunblock kills coral. Luckily, because of the suits, you’ll only need it for your face. 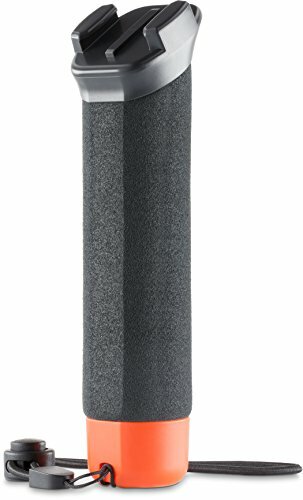 If you want to take photos, the minimum you need is a GoPro and floating handle. 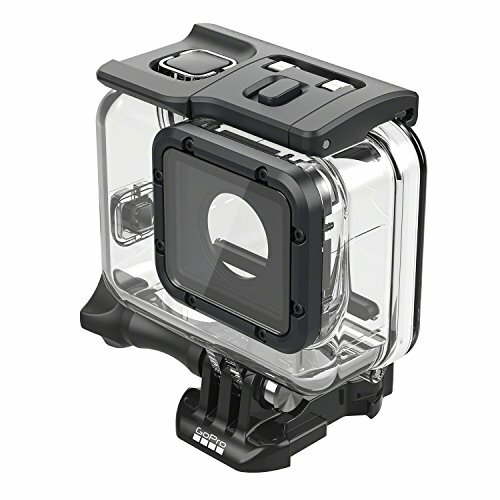 For scuba use, below 10 m a plastic housing is recommended. 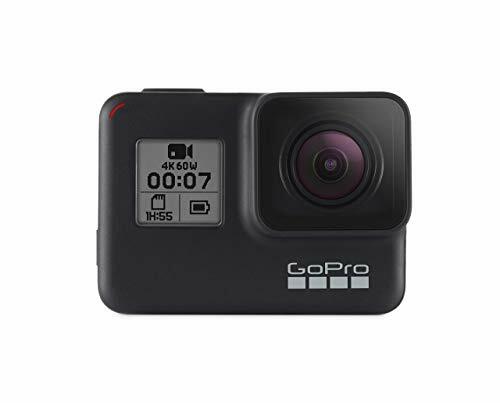 Your GoPro’s buttons won’t work below 10 m because of the pressure but hopefully, it will survive, ours is still fine after going way below 10 m on every dive. As a beginner you probably won’t want to be messing about with cameras at the same time as equalising, checking your gauges, regulating your buoyancy and remembering to breath. Check that accessories are compatible with your GoPro model. Me and my boy entering a new era of dive buddy awesomeness, but what did we think of the course? What Mommy thinks and what D thinks, because Mom has to happy too, of course. Mum’s verdict is this. I felt fine with trusting my child with these guys and the way he was taught was far, far superior to the way his dad and I were taught over 20 years ago. In all honesty I’m lucky to still be alive after my shoddy instruction. Divers Den were the business and he’s come out of this a competent diver. He’s buddy dived with me several times now and other than his tendency to get lost ( which he totally gets from his father) he’s good to go. So will you or your child, be learning to dive? Tell us about it in the comments. 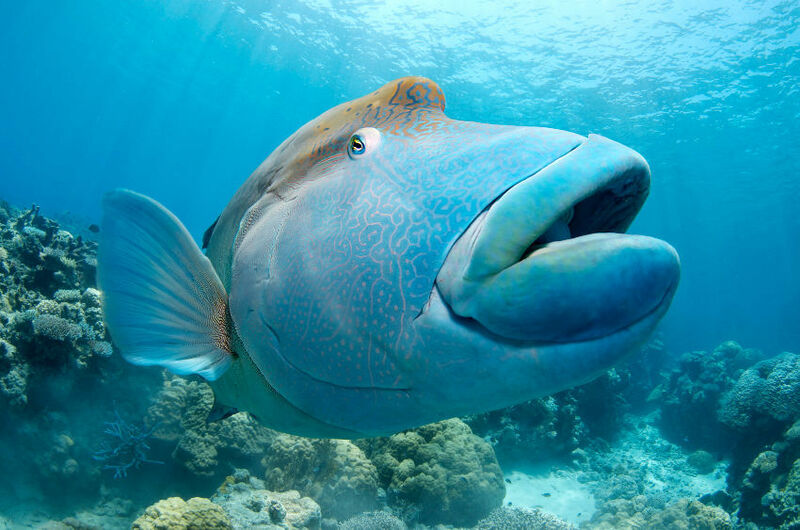 If you’re looking for information on Things to do in Cairns, maybe Reef Trips From Port Douglas, Things to Do in Port Douglas or just about anything relating to our region, it’s all on this website, just click through!